Bioluminescent imaging (BLI) coupled with hydrodynamic (HD) dosing of luciferase-expressing plasmid DNA (pDNA) has proven to be a powerful method for quantitatively benchmarking non-viral gene expression in the liver. The expression of luciferase or knockdown of luciferase by RNA interference (RNAi) in the liver is quantifiable over five-orders of magnitude in living mice. The photon emission data derived from BLI can be converted to the absolute amount of luciferase expression by comparison with a standard curve developed using luciferase as a primary standard. 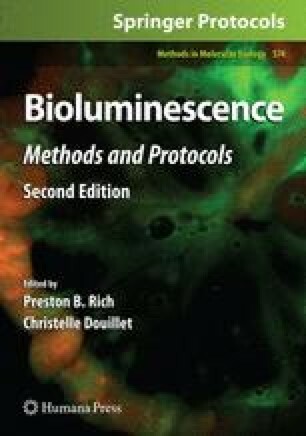 Quantitative BLI is also applicable to luciferase expression in other tissues, such as skeletal muscle, following intramuscular (IM) dosing and electroporation (EP) of pDNA. The primary advantages of using quantitative BLI in mouse liver and muscle are the sensitivity of the assay, the speed and ease of making measurements, the precision and linearity of the dose–response curves, and the ability to conduct serial sampling of gene expression over many days or months while eliminating the need to euthanize animals. The authors gratefully acknowledge support for this work from NIH DK063196, DK066211, and Pharmacological Sciences Training Grant (GM 067795).